Soon after England secured the Ashes to seal their decade long dominance over Australia at home, they were met with some more positive news. Joe Root was the new world number 1 ranked test batsman, overtaking AB De Villiers. Root has been magnificent for England in both limited overs and tests since his debut about two and a half years ago. So much so, that he is now not only England's most reliable batsman but among the best in the world. We have seen a number of great batsmen in test cricket. Each decade has provided us with some of the game's greats like Border, Gavaskar, Miandad, and Richards in the 80s; Waugh, Sachin, Lara, and Inzamam in the 90s, Ponting, Dravid, Sangakkara, and Kallis during the first decade of the new century; and also Younis Khan, De Villiers, Amla, Clarke, Cook, and KP over the past decade. Similarly, the past 5 years has seen the rise of a new generation of batsmen. Like Joe Root for England, there have been a few others who have emerged to become their team's most reliable batsmen in the recent few years. There has been Virat Kohli for India, Steven Smith for Australia, Azhar Ali for Pakistan, Kane Williamson for New Zealand, and Angelo Matthews for Sri Lanka. Each one of them has performed at an exceptional level in international cricket and has fast become the mainstay of their respective batting line up. Their success has also been recognized with all of them, barring Root, captaining their national side in at least one format (Kane Williamson as a stand in). There is no doubt in my mind that these are the next set of batting greats that will shine for the next 7-10 years in test cricket. These are the names that will dominate batting charts going forward. But who among them is the best out of the lot? Like Border and Gavaskar, Sachin and Lara, Ponting and Kallis, and Sangakkara and Younis were the best during their respective decades, which two out of the current lot are the best right now? Here's a look at some numbers. 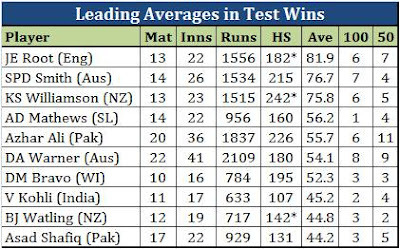 It is no surprise that each one of the above mentioned batsmen are among those with the current highest test averages, with Root and Smith right at the top. Four of these batsmen have scored at least 10 test centuries already, but no one scores them more often than Virat Kohli who scores a ton after every 5 innings or so. The most prominent sign of great test batsmen is how often they produce match winnings knocks. Most batsmen can score a lot of runs, but scoring meaningful runs that help win matches is what makes these batsmen great. 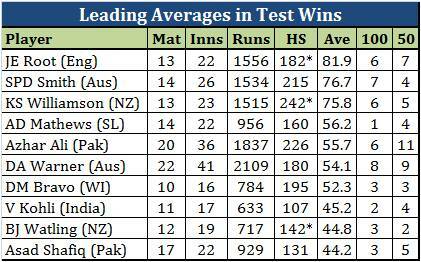 Warner and Azhar have been involved in most test wins among these batsmen; both of them are the leading run scorers in test wins as well; Root, Smith, and Williamson have exceptional averages in test wins; while Warner and Smith have the most centuries in test wins. If it doesn't get better for India, Kohli would well become the Tendulkar of his generation. Lots of runs and centuries, but not enough match winning ones. Everyone knows that it is much easier to bat at home than in foreign conditions. In this regard, Azhar Ali and Asad Shafiq must be given a lot more credit than the other batsmen considering that they have not played a single test at home. Having said that, here's how these batsmen perform in foreign locations. Foreign locations have been determined as outside Indian subcontinent and UAE for Azhar, Asad, Kohli, Matthews; outside Australia and South Africa for Warner and Smith; outside England and New Zealand for Root, Williamson and Watling; outside West Indies for Bravo. Only Bravo and Root average above 50 in foreign conditions; while Kohli's and Williamson's century hitting ability in foreign conditions is exceptional. 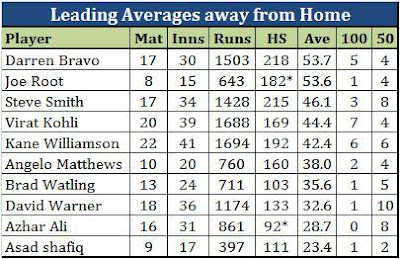 Bravo's is a rare case; he averages more away from home than he does at home, and 5 of his 6 test centuries have also come away from home. 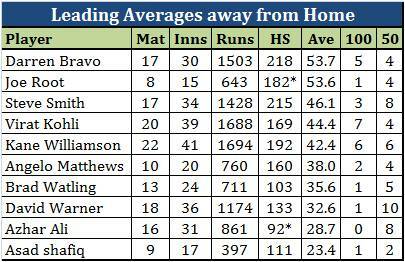 The rest of the batsmen seem to have decent records away from home, except for Warner, Azhar, and Asad - while away. they are not even half the batsmen that they are at home. While all these batsmen are special in their own way, there are only two names that are repeatedly at the top of the pile in the tables above. Joe Root and Steven Smith. 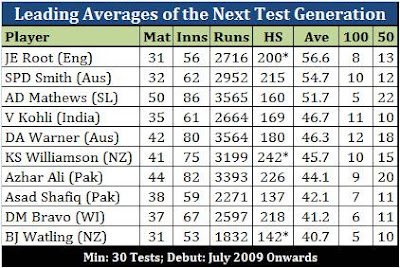 They have the best average among these batsmen, they score test centuries as frequently as the greats did, they are the leading performers in test match wins, and they have outstanding away records. The other 8 batsmen have a lot of catching up to do. Warner, Azhar, and Asad need to significantly improve their away records, while Kohli has to put in more match winning performances. Williamson is not far behind Root and Smith, however to be considered one of the greats he needs to push his average closer to that 50 mark; same goes for Bravo and Watling. As for Mathews; he has established himself as the premier Sri Lankan batsman following the retirements of Sangakkara and Jayawardene. 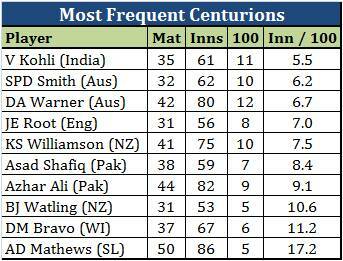 However, to be one of the greats he needs more test centuries and improved performances outside the subcontinent. While Root and Smith are ahead of the rest right now, all these batsmen are 30 or under, which means their best years are still ahead of them. There is a lot more for all of them to achieve. With the kind of start they have had to their test careers, they are well placed to reach even greater heights to be considered among the best in the world to ever play the game.